“Seeing something invisible with your own eyes is an exciting experience,” say Joachim Fischer and Tolga Ergin. For about one year, both physicists and members of the team of Professor Martin Wegener at KIT‘s Center for Functional Nanostructures (CFN) have worked on refining the structure of the Karlsruhe invisibility cloak to such an extent that it is also effective in the visible spectral range. In invisibility cloaks, light waves are guided by the material such that they leave the invisibility cloak again as if they had never been in contact with the object to be disguised. Consequently, the object is invisible to the observer. The exotic optical properties of the camouflaging material are calculated using complex mathematical tools similar to Einstein’s theory of relativity. These properties result from a special structuring of the material. It has to be smaller than the wavelength of the light that is to be deflected. For example, the relatively large radio or radar waves require a material “that can be produced using nail scissors,” says Wegener. At wavelengths visible to the human eye, materials have to be structured in the nanometer range. 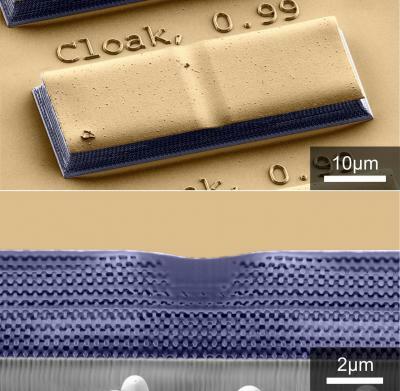 The minute invisibility cloak produced by Fischer and Ergin is smaller than the diameter of a human hair. It makes the curvature of a metal mirror appear flat, as a result of which an object hidden underneath becomes invisible. The metamaterial placed on top of this curvature looks like a stack of wood, but consists of plastic and air. These “logs” have precisely defined thicknesses in the range of 100 nm. Light waves that are normally deflected by the curvature are influenced and guided by these logs such that the reflected light corresponds to that of a flat mirror. “If we would succeed again in halving the log distance of the invisibility cloak, we would obtain cloaking for the complete visible light spectrum,” says Fischer. Last year, the Wegener team presented the first 3D invisibility cloak in the renowned journal Science. Until that time, the only invisibility cloaks existed in waveguides and were of practically two-dimensional character. When looking onto the structure from the third dimension, however, the effect disappeared. By means of an accordingly filigree structuring, the Karlsruhe invisibility cloak could be produced for wavelengths from 1500 to 2600 nm. This wavelength range is not visible to the human eye, but plays an important role in telecommunications. The breakthrough was based on the use of the direct laser writing method (DLS) developed by CFN. With the help of this method, it is possible to produce minute 3D structures with optical properties that do not exist in nature, so-called metamaterials. In the past year, the KIT scientists continued to improve the already extremely fine direct laser writing method. For this purpose, they used methods that have significantly increased the resolution in microscopy. With this tool, they then succeeded in refining the metamaterial by a factor of two and in producing the first 3D invisibility cloak for non-polarized visible light in the range of 700 nm. This corresponds to the red color.